This is a really horrifying book. 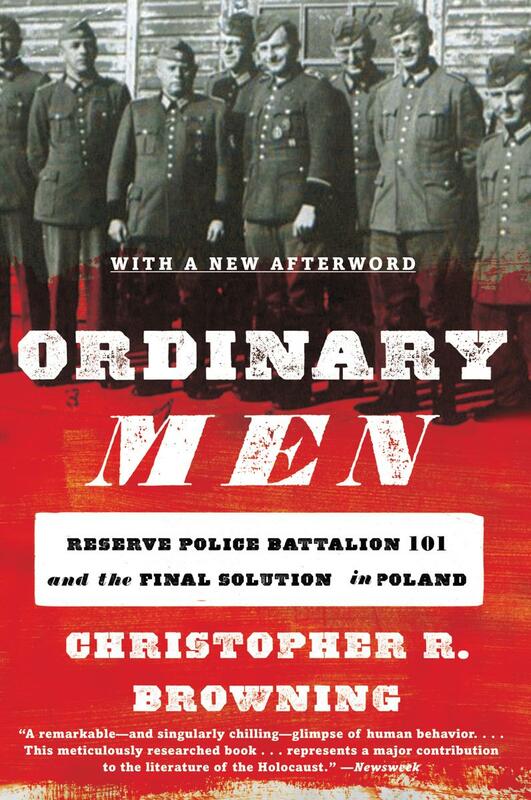 Ordinary Men tells the World War II story of German Reserve Police Battalion 101. Police battalions were units sent into occupied territory to quell civil unrest and to take care of any remaining partisan forces. They generally consisted of men too old for the regular military draft, or sometimes volunteers attempting to avoid conscription into an active military unit. They were formed of men with families and careers, the sort of men you might meet at the grocery store, or perhaps go bowling with. The men in police units were not normally those you'd consider likely to become mass murderers. On July 13, 1942, that all changed. The nearly 500 men of the battalion were sent to Jósefów in Poland. Upon arrival, Major Wilhem Trapp, the battalion commander gave the men their instructions. In tears he told them that they were to round up the 1500 or more Jews in the town and execute them. In an unusual move, Trapp invited anyone to step forward who did not want to carry out the task at hand and be assigned to other duties. Only 12 of the nearly 500 took Trapp up on his offer. Those who didn’t stepped forward were set to work, and an initially small group of them was brought to the nearby woods where they were instructed on how to execute the Jews in as swift and tidy a way as possible. With their victim lying face down on the ground, the policemen were instructed to place the bayonets of their rifles at the base of their victims' necks, and then fire. This method ensured a swift death for the victim, and was as clean and tidy as a mass execution could be. Later groups that carried out the executions that day were not given the same precise instructions, and often shot wildly. This meant that the victims' skulls were frequently blown apart, splattering the formerly tidy uniforms of the police with blood and brains of the victims. As might be expected, many of the shooters were unable to continue and were allowed to assume other less distasteful duties. Unit discipline was surprisingly loose that day, and many of those doing the shooting simply abandoned their posts without permission and slipped off into the woods. They were able to do this without any punishment from their superiors. Despite how easy it was to avoid being one of the executioners, 80 per cent or more of the battalion continued rounding up and executing the Jews until the job was completed. Upon returning to their barracks, most of the men of the unit quickly got drunk. As with most tasks that assault our conscience, repetition numbs our response – executing the Jews became easier, and even a source of merriment at times. Battalion 101 did few actual executions on their own, generally providing police cordons to prevent doomed Jews from escaping their fate. While Lithuanian "Hiwi" units did much of the actual shooting, the men of Battalion 101 were involved in the execution either directly or by providing a security cordon to at least 38,000 Jews from July 1942 until November 1943. Additionally, they forced at least 45,200 other Jews onto trains bound for death camps like Treblinka. This is a horrifying book, but not so much because of the number of men, women and children who were innocently executed. This book is not the story of those who died, but of those who killed them. After the initial incident at Jósefów, battalion discipline was tightened. Despite this, men who didn't want to be involved in the executions had little trouble avoiding the duty. When officers set up details, they generally picked volunteers. On those occasions when they simply chose people at random, it was still easy to avoid the duty by moving to the back of the crowd. It quickly became apparent that men in close proximity to the officer got picked, so avoiding this unpleasant job was a relatively simple affair. The horrifying part is that despite it being easy to avoid execution duties, it was never a problem finding volunteers, eager to go out and join the latest squad. There were always other more seemingly honorable tasks available for those who chose not to join the execution squads, such as joining a patrol to eliminate partisan resistance fighters. None the less, there was a conspicuous number of men in the unit who appeared to prefer the task of killing unarmed civilians. In reading a book like this, one has to ask how an average man could become a mass murderer. The author is quick to emphasize that these were not men trained to kill. As police officers, their military training was no better than the average. They had received no special indoctrination that prepared them for their task. Being, for the most part, middle aged men set in their ways, they were, if anything, less susceptible to the worst of the Nazi propaganda than most of the younger soldiers conscripted into military units. Only about 25 per cent of the policemen were members of the Nazi party and most of those were late joiners, coming into the party after National Socialism had become well established in Germany. In other words, most of these men weren't even committed Nazis. 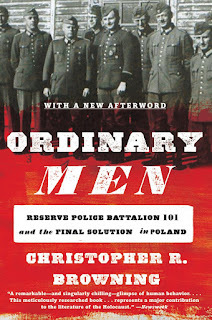 The author emphasizes that in almost every conceivable way, the men of Battalion 101 were average. They were, quite literally, ordinary men. They could well have been your neighbor next door, or the guy from down the street. So how do you explain something like this, when ordinary men become willingly involved in extraordinary evil? The author notes that psychological experiments suggest humans will readily inflict severe pain on other human beings when ordered to do so by an authority figure. It seems that the average man's conscience can be put at ease if someone else has told him to cause pain, for perhaps then he might be able to convince himself he is not morally responsible. In the case of Battalion 101, however, the normal stern authority figure who ordered the killings was a kindly older man, so distraught about the orders he brought that he was literally in tears. His instructions to clear out the ghetto in Jósefów came less as an order from an authority figure than as a request from a man deeply uncomfortable with his task. The standard explanation of many accused of heinous crimes - "I was merely following orders" - simply doesn't apply here for it was almost always possible to avoid the order with no adverse consequences. The authority figures of the battalion never took a stern line and never forced the men to kill. Some of the men of the battalion rationalized their actions in strange ways. One explained that he always paired himself with another policeman who would shoot the parent of a child. Since the child was now an orphan, it seemed only merciful to this individual to also shoot the child, for this would "deliver" him from the lonely, miserable life that orphans have often experienced. It may not have been intentional, but the policeman justifying his actions used a perverse pun. The same German word he used to suggest he delivered the child, also means "to redeem." It seemed shooting these Jews almost took on a religious significance for him. The author also contrasts the policemen with the bureaucrats in Berlin who issued the orders that Battalion 101 followed when they executed civilians, or forced them onto death trains. These bureaucrats, he notes, were able to issue their directives with relative ease because they never actually had to face the people whose deaths they were responsible for. The men of this police battalion never had that excuse. They couldn't claim that they were emotionally distant from their victims as they escorted them, one by one, to the areas in the forest where the killing was taking place. The policemen saw their victims close up, and were able to look them in the eye. The men of the battalion indicated they even struck up conversations with the men, women, and children they were about to kill though one is left to wonder what kind of a conversation could possibly have occurred. The policemen could not claim a moral distance from their victims like the bureaucrats in Berlin could. They looked many of their victims in the eye and treated them like human beings until the very last possible moment. So what could be the cause? There is, perhaps, only one explanation that makes sense and even partially accounts for what occurred. Twenty years after the fact, when facing criminal prosecution for their actions, men of the battalion were asked why they didn't step forward and avoid becoming a mass murderer when offered the opportunity by Trapp. Most explained they didn't want to appear cowardly. It was one thing to start with the executions and then be unable to finish. It was quite another to not do the executions at all. That was cowardly. Only one individual seemed to understand his own motivations clearly. When asked why he didn't step forward when given the chance, he didn't say that he was trying to avoid being a coward, but that he didn't step forward precisely because he was a coward. He was less afraid of killing innocent children than he was of the peer pressure exerted by his comrades. The true story of Battalion 101 is a horrifying tale. There was, no doubt, enormous pressure from the rest of the battalion to conform and to join the executions. Yet peer pressure is not an excuse. We don't excuse kids at school caught smoking who gave in under pressure from their peers, and, though the crime is larger, people caught in the situation of the battalion cannot be excused either. Peer pressure helps to explain their actions, but it doesn't take away the guilt. Perhaps the most obvious element lacking from all the excuses provided by the policemen is any sense of morality. Twenty years after the fact when criminal investigators interviewed these former policemen, there was no longer an immediate sense of peer pressure. The rest of their unit no longer had the same sway over them, and even that long after the events the policemen overwhelmingly indicated they had done what they did because they didn't want to appear weak in front of their comrades. They hadn't been motivated by a belief in Nazi values. Twenty years after the fact they expressed little remorse for what were clearly morally repugnant actions. Even those who had not been involved in the killing did not claim to be "too good" to kill, but they were "too weak." It is almost unbelievable that crimes of this magnitude could be discussed without any reference to morality. 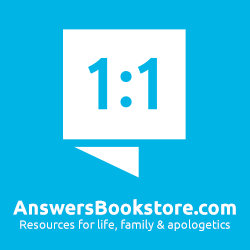 Though this is a work of history and not theology, and though the author reveals no obvious religious bias, his conclusion sounds like something straight out of the Bible. He warns against the smugness many feel when discussing the evil actions of others. As he notes in his final sentence, if under these circumstances the very ordinary men of Battalion 101 could become mass killers, "what group of men cannot?" It is in this last comment that it might be possible to finally understand the actions of these men. The Heidelberg Catechism explains that we are "incapable of any good and prone to all evil" and the Larger Catechism of the Westminster Confessions states that mankind is "wholly inclined to all evil." This is why the tale of Battalion 101 is so utterly horrifying. Their actions are not horrifying because they're so unusual, and so implausible, but because they're something we're all capable of. The level of evil to which they descended - the same evil we've seen repeated in places like Rwanda, or by individuals like Ted Bundy, Jeffrey Dahlmer, or Clifford Olson - is something that lies in the hearts of all of us. Reading a book like this is not for the faint of heart, or those prone to nightmares. As one of my grad school colleagues commented, it is almost senseless to talk about preventing these kinds of actions, for without the regenerating work of God the cause of the evil remains unsolved. Despite its disturbing story, the book is one well worth reading for it illustrates in a brutally clear fashion why reaching out to our neighbors is so urgent. If you ever needed a slight push to talk to co-workers, or the people just across the back hedge, to explain to them "the reason for the hope that you have," this book will do that for you. 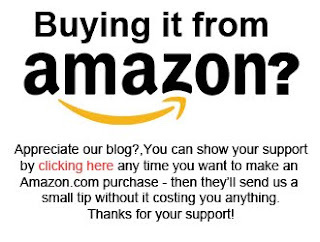 You can pick up Ordinary Men at Amazon.com here and Amazon.ca here.